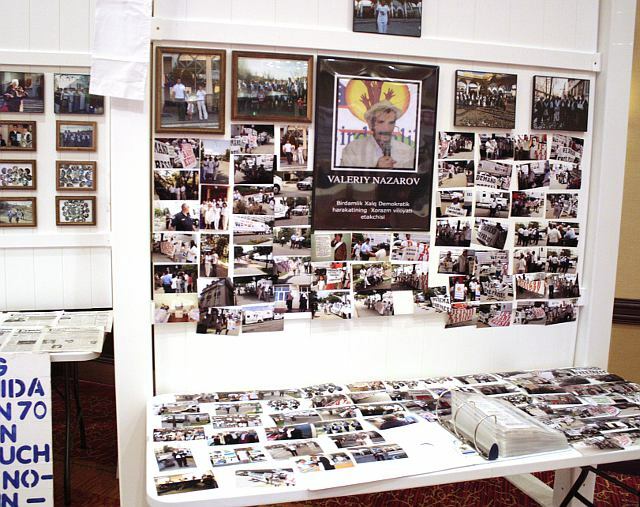 The Birdamlik political opposition movement hosted a convention in St. Louis, USA, late April, and stirred a fair amount interest in the movement. We have written many articles on the founder of the movement, Mr. Bakhodir Choriyev, and his ideas for a nonviolent regime change in Uzbekistan; we have also posted the platform of the movement and Mr. Choriyev statement on the launch of a “velvet” revolution in Uzbekistan on our website. All these publications drew sympathy and a few smiles, for such plans seemed unfeasible. After all, what kind of velvet revolution in Uzbekistan could one talk about? 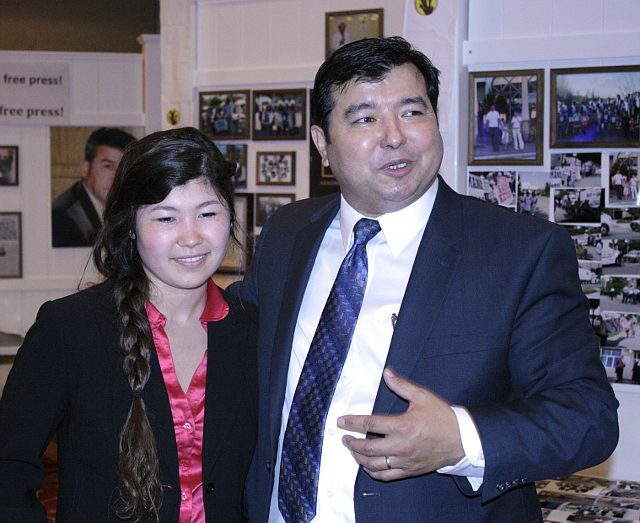 But Mr. Choriyev convened like-minded people and the supporters of the democratic movement from Russia, Kazakhstan, Europe, Canada and the USA to the city of St. Louis, where he currently resides. The topic of nonviolent [civil] resistance seems to be gaining traction, and we decided to get to know Mr. Choriyev better. Mr. Choriyev, your platform reads in part that [Uzbek President Islam] Karimov must resign from post and step down. Do you believe that it is possible? [President Islam] Karimov would never leave [his post] at his own initiative. On the other hand, we are not planning to just wait until power is transferred in its natural way; after all, when one is in power, they don’t leave [such offices] quickly. But people want freedom, changes. We must change their consciousness and persuade them to join the nonviolent struggle if we want changes to take place. You talk about a velvet revolution. But a revolution requires a big number of people, who would remain in public squares until and unless the authorities fulfill their demands. Nobody would be up for such a commitment in Uzbekistan because they would be shot at, and the case of Andijan in 2005 is a vivid example. They would not take to streets; one’s life is much more valuable, after all. In the USA, when Martin Luther King led a movement of nonviolent resistance, people were very afraid and thought that overcoming segregation was impossible. But now, look around; the President of the United States is an African-American. One would not even dream of it only half a century ago. Take India, for instance. They fired shots at people, like [the Uzbek authorities did] in Andijan. But [the Indian] people remained steadfast until the end. They organized boycotts under the leadership of Mahatma Gandhi. The nonviolent method of struggle is the most difficult one and only brave ones can endure it. Gandhi fought against external forces, namely the British. But the Uzbek army and we are members of the same nation. We are unarmed and are willing to change mindsets of those who are armed. People have different attitudes towards orders. Many are in service just to be able to put food on the table. They all have relatives and these very relatives could end up among those who will take to streets. When [President] Karimov came to power, the Uzbek population was about 17 million citizens; today, they are over 30 million. The next generation has grown up, and they understand nothing in politics and fear nothing. They are the ones we are placing our hopes on, but they must be taught with correct information via the Internet and mass media outlets. We are blocked in Uzbekistan and are not allowed to work appropriately. We are able to work with migrants, who left Uzbekistan seeking jobs, but we need informational support for that. We have launched the Mulkdor.com website, where we post a lot of information on history and culture of Uzbekistan, and our tasks; we have also updated our own Birdamlik.info website. At this time, we are utilizing our own resources to perform all of our activities. But I am certain that a wonderful day will come and we will receive support. We must patiently wait right now: as long as Afghanistan is there, relations with Uzbekistan are important for the USA, and we are creating problems [text original]. How many members does Birdamlik have? Do you genuinely believe in [the possibility of] changing minds via enlightenment? In other words, if one acquires good education and they are explained what democracy and open society are, they will then live and work the “right way” and not the “personally beneficial way”? You want to resolve the problem of corruption by allowing the officials and power-wielders to open their own businesses and enterprises. That is a very strange approach. I was an official figure myself [in Uzbekistan]. Salaries are scanty, while expenditures are ample. Where do I take [the difference]? I cannot approach my boss and say I want a raise, right? We want to create a country of proprietors in Uzbekistan. We will privatize lands using vouchers, open borders and cancel the practice of state orders. Let them get land, work and enrich themselves. Remember the practice in Russia? They allowed entrepreneurs to earn money, while salaries of officials and state employees remained scanty. That was a big mistake. But we want for the official to be able to earn as well. We at the Party of Liberal Economy, which we will register in Uzbekistan after the revolution, will teach the basics of entrepreneurship to either the official himself or a member of his family—wife, sons, relatives; let them establish their businesses. To be transparent, we will have a 51% stake in that business so long as the official remains in office. However, the entire revenue will still belong to said official’s family. And when he retires, we will throw a solemn party and return him his share. What kind of tackling corruption could one be talking about, if a business-owning official will be lobbying his interests while in office? The official in question could abuse position to influence competitors? Our political party will control that precisely by holding a 51% stake. If [an official] accepts a bribe, he immediately loses that business. That is “shadow” economy. And there will be an open one, where everyone would pay taxes. We will grant amnesty to everything and legalize it; we will then decrease taxes and will not touch anyone—let them get rich and develop. Yes, after the revolution, we will punish those who violated the law. If one is guilty, they will be imprisoned. But we will not take away their business or money. The [culprit] will serve term, but we will not seize the money he embezzled under the condition that he will return it to Uzbekistan from [accounts] abroad. The money has to be in circulation in Uzbekistan. What a program! But its fulfillment would only be possible if your Party of Liberal Economy becomes the only political force in society, like the Communist Party was in the former Soviet Union. What if you do not enjoy that much electoral support? We will then know that we are missing something and made mistakes. We will work. You are describing an ideal society that you will rule. Achieving such a society requires a lot of work and contribution to the changing of people’s minds. What we have now is a completely corrupt country and a total lack of control. I am not saying that every single official is a bad one. There are good ones as well. Let them work with us in our team. We will engage many honest and educated people and everything will be under our party’s control. I have always tried to have honest people around myself. Of course, there were instances when I was lied to and cheated… [Smiles] But that is fine. If one is a cheater or a liar, I do not work with him anymore and find someone else. It is working [so far]. Bakhodir, Russia has already experimented with privatization and vouchers—the program has lost its appeal. A neighboring country is already practicing the parliamentary form of governance, which you want to establish in Uzbekistan, and it is not an exciting experience. So why do you think people really want such changes and that they would remain in streets even under the threat of death from [the Uzbek state troops’] firearms? When privatization was launched in Russia, people did not know what was happening or what the market economy was. It was a “therapy by shock,” which was implemented prematurely. The people had to be educated and explained such matters first, and then under reforms. But 20 years have elapsed since those times, and people now understand the concepts of capitalism, market economy, and proprietorship. Everything is different now. We are advocating for a complete transition to private ownership in Uzbekistan. Our team will be disciplined and rigorous, and the people will see that it is a just [approach]. If our fellow party members will commit something bad, we will impose strict punishment. Our goal is to establish a just society. The land is to be transformed into private property, the borders must be opened, and entrepreneurship must be free. Bribery will become shameful because everything can be achieved without bribes. You are an idealist, apparently. What makes you think you would be aware of everything at all times? What makes you think you would be able to control everything? Nobody is going to report anything to you, right? Yes. The authorities were afraid that if one becomes a proprietor, he could achieve a lot. That is something the official person is unable to do. I was incarcerated and my business was seized. I got involved in politics. In April 2004, I have lodged an official letter with the police chief of Khamza District, in which I informed about establishing the Birdamlik movement and going into opposition. I have done just that when I was establishing my private company. I was alone at early stages. But over the last decade we have grown in number. People can see that I sincerely work, and they believe me. Earning trust is the most difficult task. And I think that when we rise to power, everything will certainly work out for us. There will be no embezzlement, because everything will be done from-top-to-bottom. If I start embezzling, then those around me would do so, too. After all, half of bribery always goes up [the chain of officials]. But if I am honest, then they would be afraid to accept [bribes]. I always talk to people. The higher you sit, the worse you see. Caliphs used to directly communicate with people; here in America presidents meet people as well. No corrupt authorities communicate with the people. Can you talk about your life here? I own a house. I have personally renovated it up to the roof. It was in a horrible condition. It is a one-story least expensive house, which with a 30-year mortgage. I am paying it. Two of my daughters are in college—one in medical school, the other is learning business. My third son is getting ready to go to college and is currently choosing a school. My youngest child is only 10 years old. They are not US citizens, but will be. And I will not, because I am planning to participate in presidential elections in Uzbekistan after the revolution. No desired outcome can be expected from such elections unless there is a revolution. When the current political regime in Uzbekistan changes, we the elder generation of émigrés will return. It is very difficult for us here—a different culture and a different attitude toward life. It was closed earlier this year due to violations. They started pulling over our trucks too often. They don’t like us here. Do you think because of politics? Mr. Choriyev sincerely believes everything he says. He is certain that if Martin Luther King and Mahatma Gandhi were successful, then he, too, will be successful, albeit not after the first attempt. He launched several businesses from scratch, he learned how to live and earn in America, and the movement under his leadership is growing. He likes to repeat that one needs to calmly proceed forward, forward at all times, even if steps are short, and never lose hope and keep the goal in sight. The youth must be enlightened. Peaceful campaigns are to be staged and people are to be asked not to be afraid. Members of Birdamlik living in Uzbekistan must be given computers, cameras, and small amounts of donations, which he has been transmitting since 2005 with the least amounting to USD100, while some amount to USD200-300. 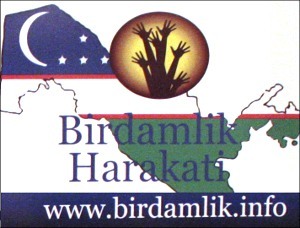 Since the establishment of Birdamlik, he has spent some 235,000 USD of his personal funds to support and grow the movement. In total, about half a million US dollars, including donations, were spent. “People in Uzbekistan work from morning till night to win a piece of bread. If one gets engaged in political activities, arranges appointments, talks to people, and bears expenditures, we must then compensate him for all that,” Mr. Choriyev explains. But what makes Birdamlik so attractive for other Uzbeks: its program’s naiveté? Perhaps the remoteness of is goals? Or the feeling of involvement in a political process that does not advocate for or urge to commit armed violent regime changes? 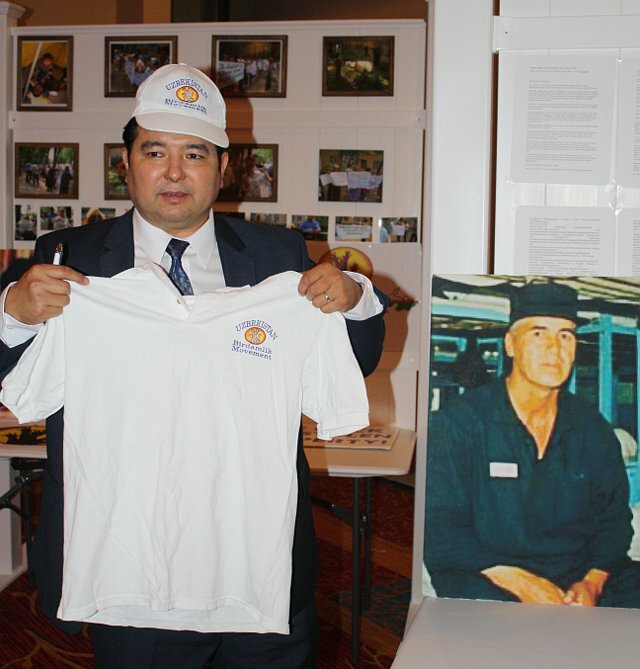 “I support any leader who opposes the dictatorial regime in Uzbekistan,” says Gafur Yuldashev, who used to work for the Uzbek-language service of the Radio Free Europe/Radio Liberty and lives in Canada after the tragic events in Andijan in 2005. But the Birlik movement is close to nonexistent. I respect Abdurakhim Polat, the Birlik leader, as a scientist. However, he writes negatively about Choriyev and scolds him. That is something I cannot digest. I do not know him personally, and never met him personally, neither have I met Muhammad Salih, the Popular Movement of Uzbekistan leader. I have met Choriyev for the first time yesterday; I only talked on the phone with him until then. However, I have written several times over the Internet to Salih, offering him to talk, but he does not want to. Choriyev, on the other hand, is always open for a conversation, if he has the time to talk to me, he does. I live in Canada, and started learning English and that is very difficult. I know how difficult it is to earn for a living here. And Bakhodir Choriyev could do that; he is sending his own money to people as well. After the Andijan events, I lived in Bishkek, Kyrgyzstan, awaiting the status of refugees. He has wired money for us and several other families just to support us. I did not even know who this Bakhodir Choriyev was back then. I only knew bits of information here and there as a journalist. He says he has bought 37 personal computers and 19 cameras for the Birdamlik branches in Uzbekistan, and I believe him. He did not accept any grants for his struggles and has been contributing his own money; that is the kind of a leader we need in Uzbekistan! I support him. When his father Hasan Choriyev died following his release from prison after being amnestied, I expressed my condolences to Bakhodir and asked him whether he would change his opinion on nonviolent struggle. Islam Karimov is a dictator and he simply kills people. But Choriyev responded, saying he knew of no other way. Not only myself, but also all other Uzbeks [abroad] have relatives in Uzbekistan. They are simple folk. How could one raise arms against them? “So we stopped and police officers came closer. Bakhodir was handcuffed and taken away. And I could see that he was no coward, and he is courageous, who is full of steadfastness and desire to struggle. And I realized that I want to support this movement. The issue of uniting with other political parties of Erk and Birlik was raised several times at the Birlik convention. However, such proposals were accompanied by harsh criticisms of said parties’ leaders. For instance, the leader of the Birlik party, Abdurakhim Polat, was not even invited to the convention. I was not told what exactly Polat wrote about Choriyev, but apparently something very offensive. 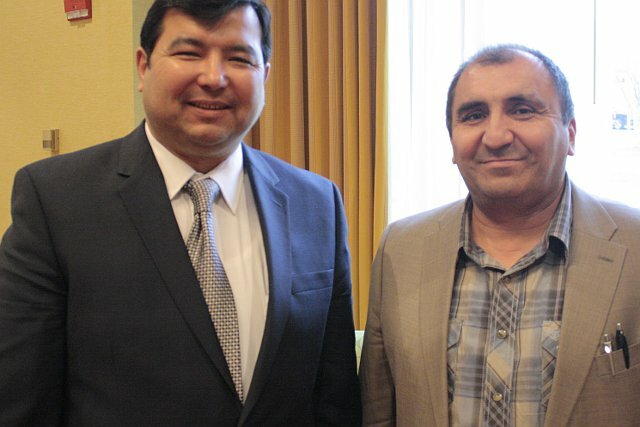 Uniting the Uzbek opposition parties and movements currently based abroad is an impossible task at this time. On the other hand, the change of power in Uzbekistan is a remote and rather vague scenario, which obviously requires lots of money (and no donor will grant money as long as the “Afghan problem” exists. Given there is no realistic and close opportunity to gain power in Uzbekistan, no opposition leader would sacrifice his personal ambitions and throw grudges aside. Peace and truce with opponents does occur, yet last very short time. Perhaps it is wrong, but unavoidable. After all, secular opposition movements’ desirability and attractiveness mostly, if not entirely, depends on their leaders’ personality. Obviously, nobody would give up personal ambitions and forfeit charisma.